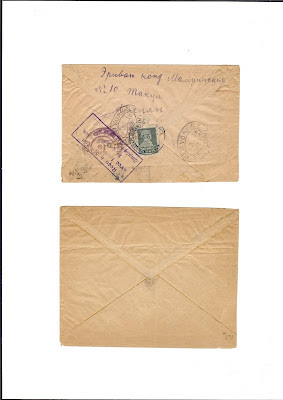 After 1923 and the disappearance of distinctive stamps, Armenian postal history does not immediately become more common. In fact, it is hard to find - and what little exists is buried deep in dealers' Soviet Union boxes. But when you do find it, it is often cheap. Here are two covers. 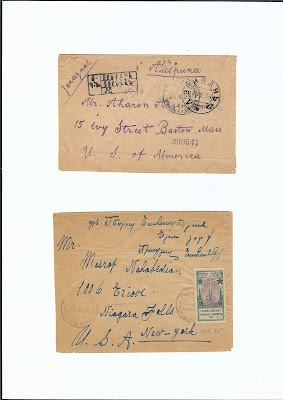 The first from February 1925 shows a new Yerevan bi-lingual cancel and Registration cachet in use, front and back in blue-green - and alongside it on the front what seems to be the old Imperial ERIVAN "a". This canceller is now so old that the date has slipped to give the year as "14" instead of "25". But wait a minute! Look at the bottom South West corner of the old ERIVAN "a" cancellation. Here there should be one of the two stars. Instead there is a large "V". What is going on? Is this canceller now being used in a Sorting Office (identified by the "V") or is it being used as a Censor's mark (with the "V" equivalent to a triangle?). Information, please! The cover was routed through Moscow, where the Censor's lying violet cachet was added, declaring in French that the letter had been received in Moscow with the flaps not properly sealed. 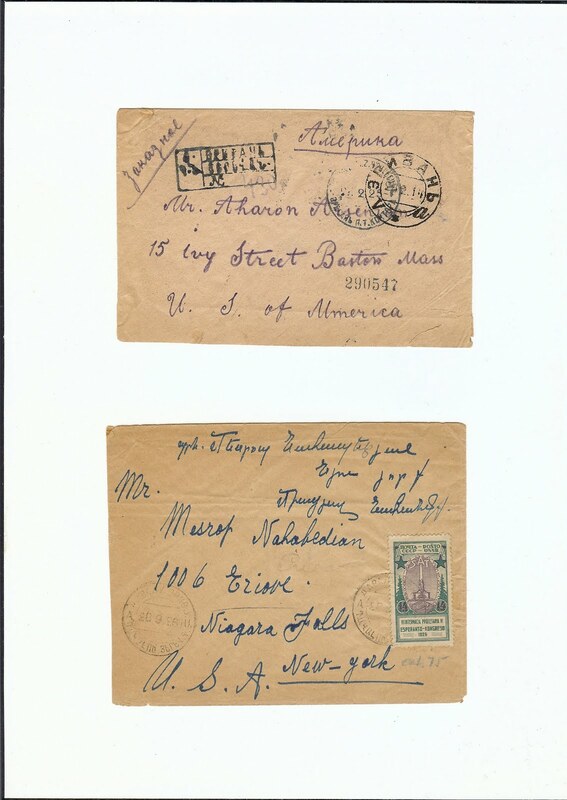 That the cover was opened and re-sealed can be seen from the way the Yerevan cancel over the stamp is slightly out of line on the right hand side. Traces of extra gum can also be seen on the inside of the envelope. But the letter arrived in New York in March 1925 in just under a month. The second has a new DAVALOU ERIV. 28 9 26 bi-lingual cancel which can be found at page 58 of Christopher Zakiyan's book, illustrated there with a 1935 date. There is no receiver cancel, but the evidence that the cover arrived is provided by the fact that an idiot has written "cat. 75" [Scott, I bet] in blue pencil under the stamp - and on the back there is a very old pencilled price in the US style "1 oo" with a line under the zeros. My guess is that most external Armenian mail in the period 1924 - 30 went to just three destinations: Russia, France and the USA. So if you are able to look through dealers' boxes in those countries, you might still find something. But I have a confession: I didn't get these items from a dealer's box. I got them from a dealer but he knew that they were scarce items and offered them to me at sensble (expensive) prices. Never Let Anyone Sign Your Covers!